It’s always a huge compliment when another design, stationery, or other paper-related professional hires you to letterpress print work for them personally. 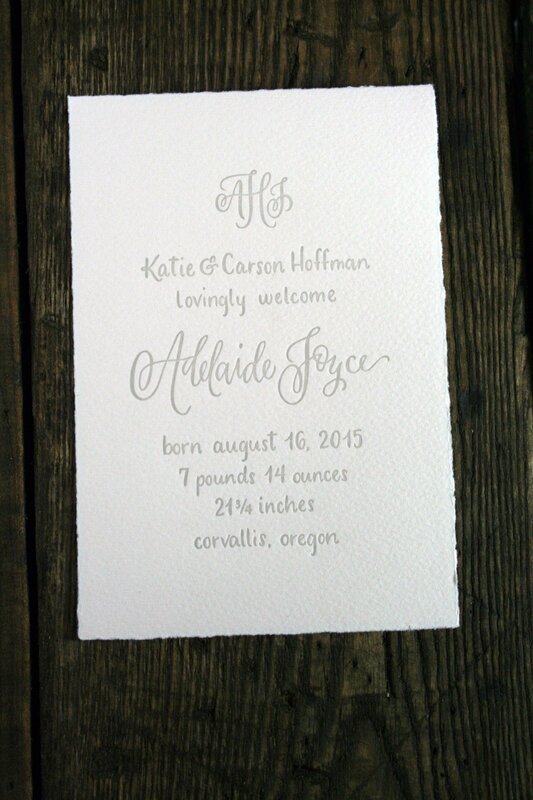 Twin Ravens Press began working with very talented calligrapher, Katie Hoffman, of Katie Hoffman Ink, in Corvallis, Oregon, not all that long ago, and we were thrilled when she hired us to letterpress print her first-born daughter’s baby announcements this past fall! Adelaide’s announcements are simple, beautiful, and classic. Katie did all of the calligraphy and design herself, including creating the custom monogram at the top. They were printed in a very light, warm grey ink on light pink Arturo cotton paper. Arturo paper is mould-made to size (rather than produced in a large parent sheet and then cut to size), so each announcements had authentic deckled edges all the way around! So pretty!! Thanks so much Katie for working with us to announce and welcome your little girl into the world!! I was putting away samples earlier today and came across this absolutely sweet birth announcement we made last year for one of our long-time clients, Amy. Amy had her second child, a boy, during the summer of 2012 and we created this adorable announcement to announce his birth! Elliot’s announcements were extra fun to create, because Amy wanted them to coordinate with her older daughter’s announcements which we had created back in 2009. If you’d like to check those out, click here. If you visited that link, you’ll notice that both announcements for Amy and Matt’s kiddos are similar in style. They’re both an A2 size and they both feature little buzzing bees. 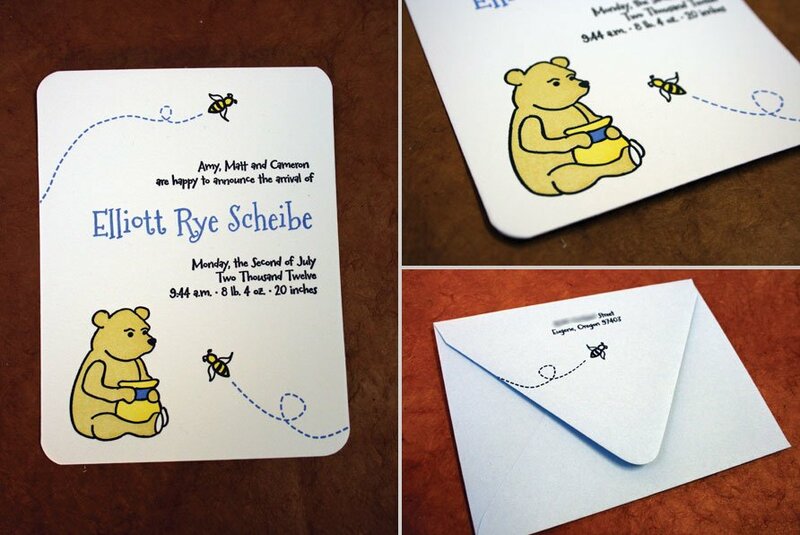 The envelopes are exactly the same, just different colors, but Elliot’s also feature a teddy bear along with the bees. What a cute announcement for the newest addition to Amy, Matt and Cameron’s family! Thanks so much again Amy! You’re the best! It’s been super-cold for several days up here in Oregon, so, today, I’m going to show off some light, warm, cheery baby shower invitations that we did last fall for event planner, Lauren Stewart, in California. We’ve worked with Lauren and her clients several times before, so I was both honored and excited to be printing the invitations for her own baby shower! 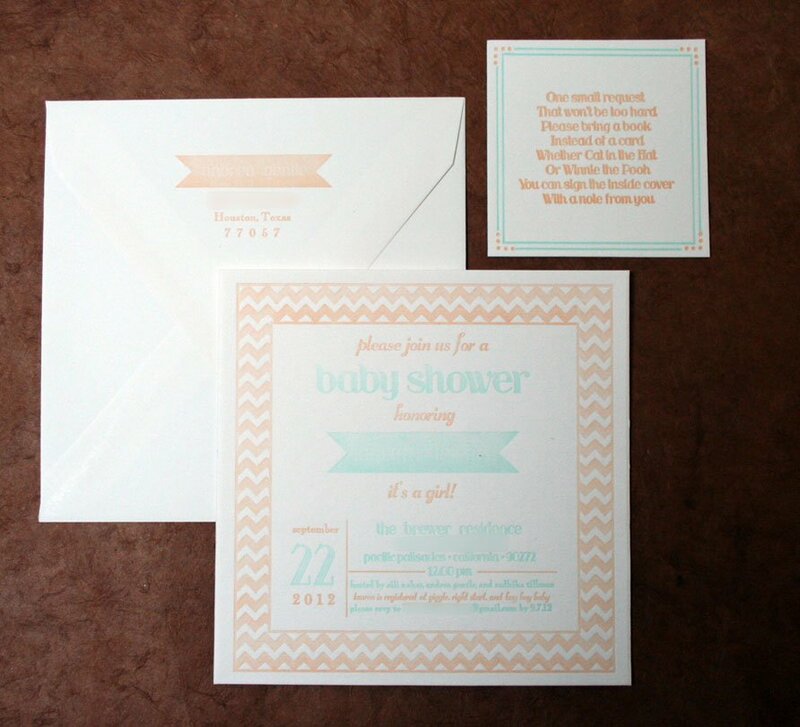 Lauren’s shower invitations were printed on 5.5″ square cards in two ink colors: a lovely pastel peach and a lovely light turquoise. They were printed on super-soft Holyoke 100% cotton paper and were paired with a matching envelope from Waste Not Paper Company. I love the mix of whimsical fonts, fun patterns and borders and the cute banners that Lauren used on both the invite and envelope. Aren’t these cute?!? Due to the lightness of Lauren’s name in the banner, from printing in such a light ink color, Lauren ended up hand lettering her name into the banner in gold to give it more contrast. She also hand lined her envelopes with a fun gold-polka-dot paper to match. So cute!! 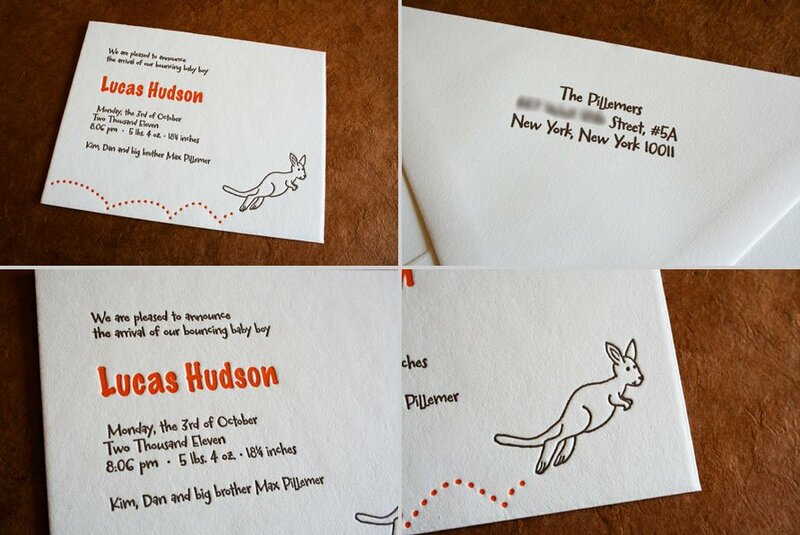 The envelopes were designed to coordinate and featured her party’s host’s address on the back flap in peach-colored ink. 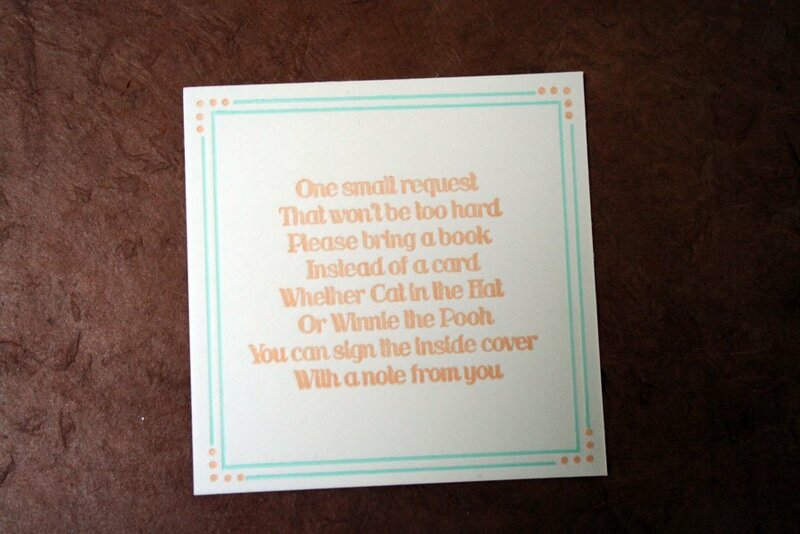 Lauren also had us print an adorable, smaller square insert with a cute poem requesting that guests bring a children’s book instead of a card to the shower! Such a cute idea and a wonderful way to start up a collection of books for your little one! Thanks so much again for working with us on these Lauren! I’m sure your little girl is absolutely adorable! This past fall, we worked with an awesome family in New York City on a very cute set of birth announcements for their second son, Lucas. These announcements were simple and adorable, just like a brand new baby boy! You can see the announcement we designed and printed above. It’s an A2 size and was printed in two ink colors with matching white envelopes. 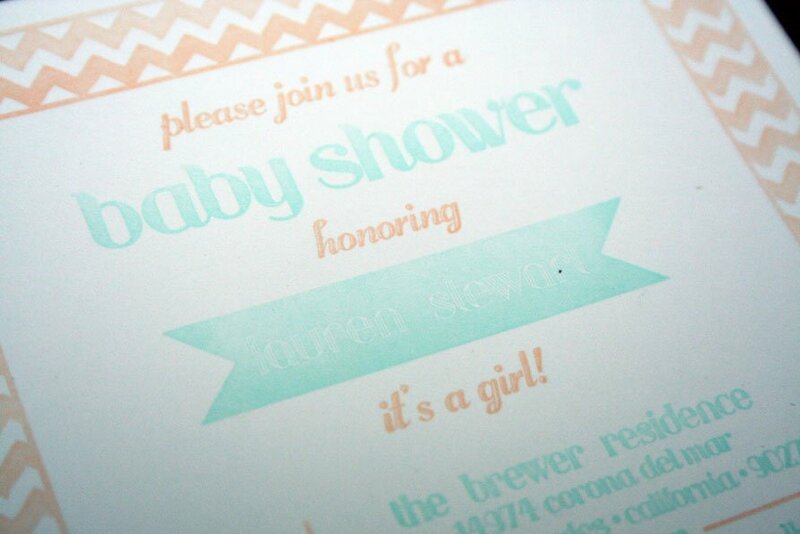 One of my favorite things about designing baby announcements are the cute fonts and colors! 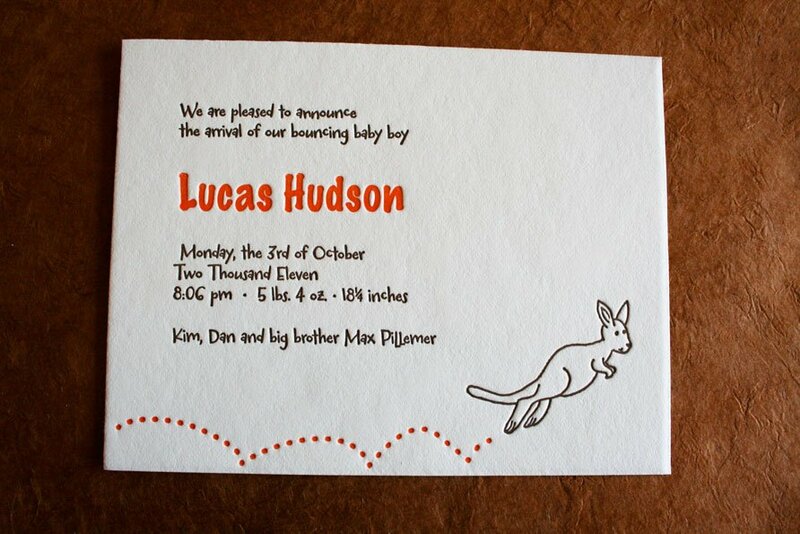 Lucas’ announcements were printed in orange and brown and featured two different, adorable fonts and a hand-drawn baby kangaroo with a little orange hopping trail printed behind him. Aren’t those just adorable?!? I love ’em! Lucas’ mom, Kim, also had us design a matching set of flat thank you notes as well. The thank you cards were also an A2 size and were printed on the same 100% cotton rag Holyoke paper as the announcements. 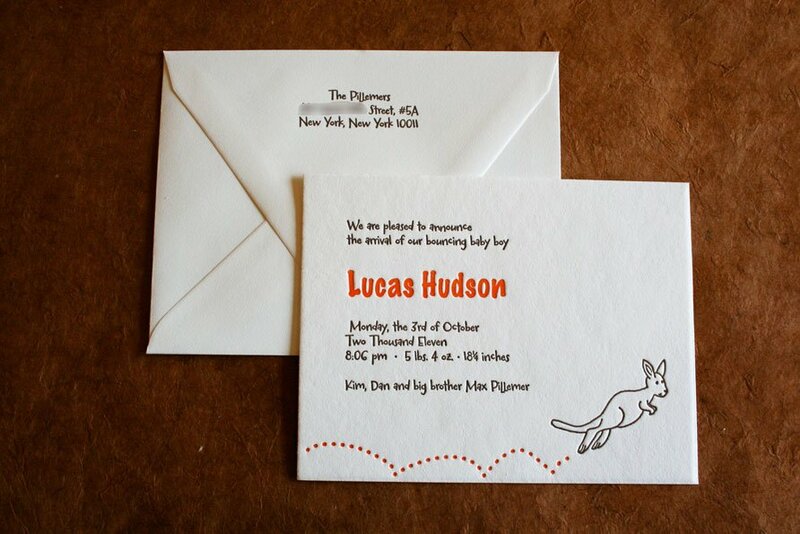 They featured the cute kangaroo and Lucas’ full name in orange at the top. 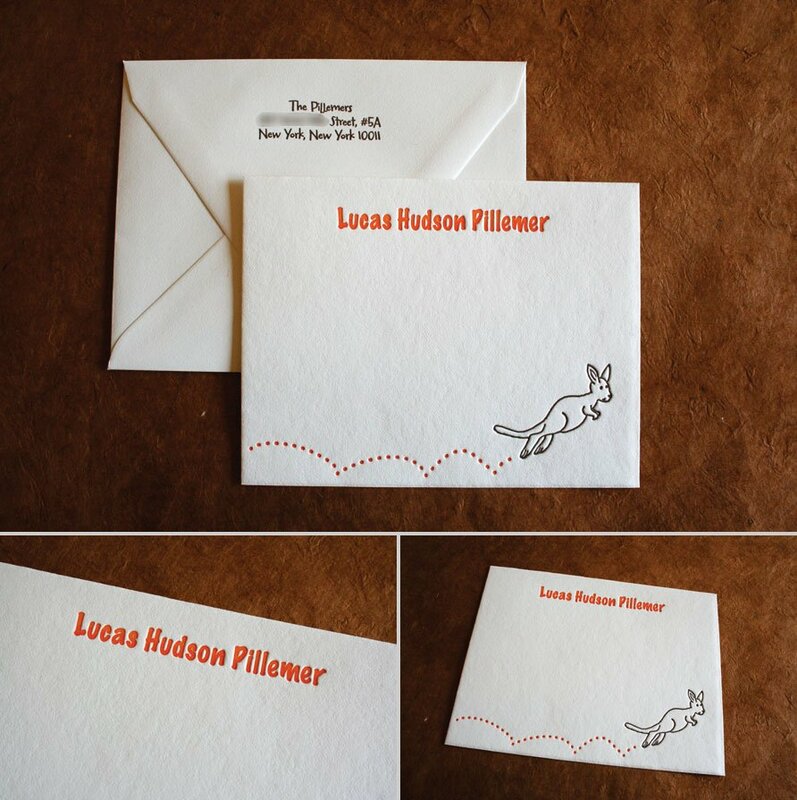 We paired them with white envelopes with the Pillemer’s return address letterpress printed on the back flap. Thanks so much for working with us Kim! I just love how these turned out! Right before the Thanksgiving holiday last week, I finished up a set of really adorable baby announcements for a local couple, here in Eugene, that I’ve known for some time. Sean & Rebecca just had their first child in late October, and I was super-excited when Rebecca asked me to design and print birth announcements for them! Before she was born, Rebecca and Sean knew they were having a little girl, so we worked on several cute designs prior to her birth, and Sean and Rebecca ended up choosing this one. They have two pups in their household – a daschund and a basset hound, and Rebecca thought it would be cute to have their silhouettes featured on Katie’s announcements. I couldn’t have agreed more! Katie’s announcements are an A2 size flat card, which measures 4.25″x5.5″. They were printed on Holyoke 100% cotton rag Bone White paper in two ink colors: a deep, chocolate brown and a light, baby pink. They were paired with matching A2 size pink envelopes from Waste Not Paper Company, and had Sean and Rebecca’s address letterpress printed on the flap. The announcements were designed using two fun fonts! All of Katie’s information was printed in chocolate brown ink in one of the fonts and her name was printed larger in pink in the other font. For the design at the bottom, I created two silhouettes of each of the Sullivan’s pups and printed them in chocolate brown. They each have little pink footprints trailing behind them, and the daschund is chasing a little pink butterfly. Aren’t those too cute?!? Check out the letterpress impression below in the Holyoke paper! I know I’ve been saying it a lot lately, but Holyoke is quickly becoming one of my favorite papers for letterpress printing. It’s just so pretty and wonderful to the touch! Thanks so much for the custom order Sean & Rebecca and congratulations on your new little lady! I can’t wait to meet her! See you soon! Ladies and Gentlemen, brace yourselves. For what you are about to see and read about, will quite possibly be the cutest thing you’ve seen and read about all week. The baby announcements we created for Elizabeth’s parents, Edwina and John, were completed last week, and man, are they cute! These announcements were printed in two ink colors: a light lilac-y purple and a light green on super-soft, 100% cotton rag, Holyoke Bone White paper, and came with matching, light purple envelopes from Waste Not Paper Company. These announcements featured a matted photograph of the cute little lady on the center panel of the tri-fold design. Above you can see one of the announcements and envelopes. The birth announcement information was printed on the left hand side with a cute little monkey and two little butterflies, and the right side of the tri-fold featured and panda, turtle, more butterflies, some pretty bamboo, and a calendar with Elizabeth’s birthday circled. Above you can see the two letterpress printed panels of the tri-fold design a little closer. I just love all of the whimsical little details in this design! There is also a lot of symbolism in these announcements. Elizabeth’s family has a partial Chinese background, and having panda bears associated with babies in Chinese (and a few other Asian cultures) is considered to bring luck and happiness for the child. You’ll notice that these announcements also feature a small turtle wearing glasses. Elizabeth’s late grandfather on her father’s side was nicknamed “Turtle”, and Edwina and John wanted there to be a little reference to him here as well. One of the most fun things to me about designing baby announcements, aside from the fact that you often get to draw really, really cute things, is the fonts that you can work with! I just love the three modern, very playful, fonts we used in Elizabeth’s announcements. We used different fonts for the little calendar on the right-hand panel and different fonts for her name and the main text of the announcement information. I just love how playful and light-hearted all three are! So much fun! 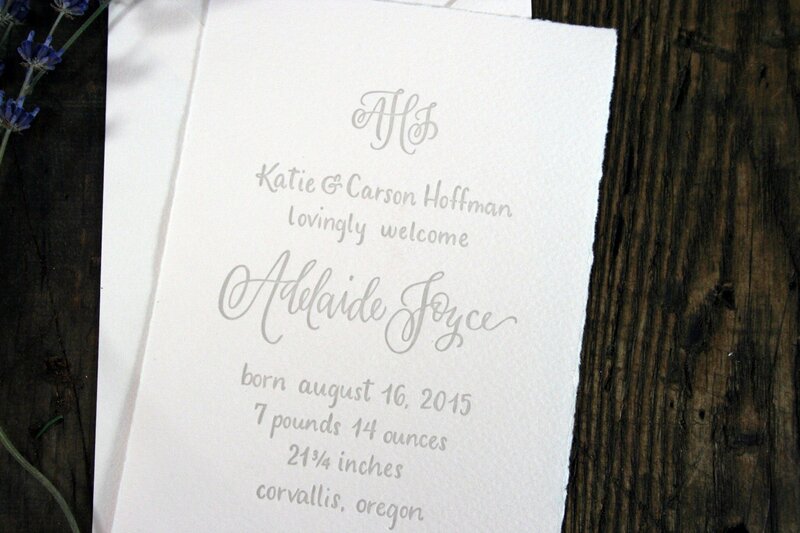 Another thing to note about these adorable birth announcements is the wonderfully luxurious letterpress impression that we were able to achieve. At Twin Ravens Press, we always strive to have at least some impression in all of the work we do, but depending on the design, and on the paper and other materials being used, sometimes it’s easier to get a deep impression than other times. 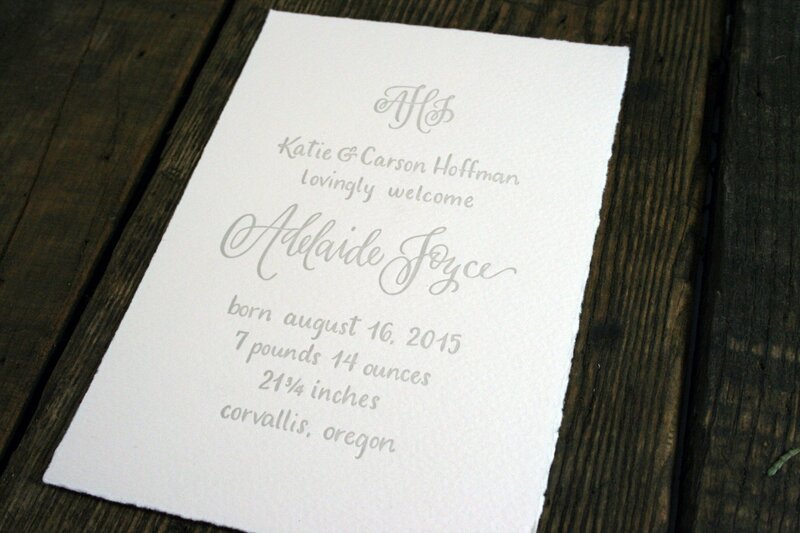 With these announcements we used super-soft and thick 100% cotton rag Holyoke paper. Holyoke paper is specially manufactured for letterpress printing, by a company that does letterpress printing themselves, and it’s quickly becoming one of my most favorite papers to print on. In all of these photos you can just see the deepness of the impression without having to look very hard. This, combined with the fact that the paper is thick and wonderfully soft, make it one of the nicest papers I’ve worked with. I mentioned above that the center panel on Elizabeth’s tri-fold announcements featured a photograph and no letterpress printing. Edwina and John picked out three, totally adorable photos of their little girl to use in these announcements. We had the photos printed by a photography studio here in Eugene, and they were each matted on a small, light purple matt and then matted onto the center panel of each announcement. The paper we used for the photo mattes matches the purple envelopes that were created for the announcements as well. 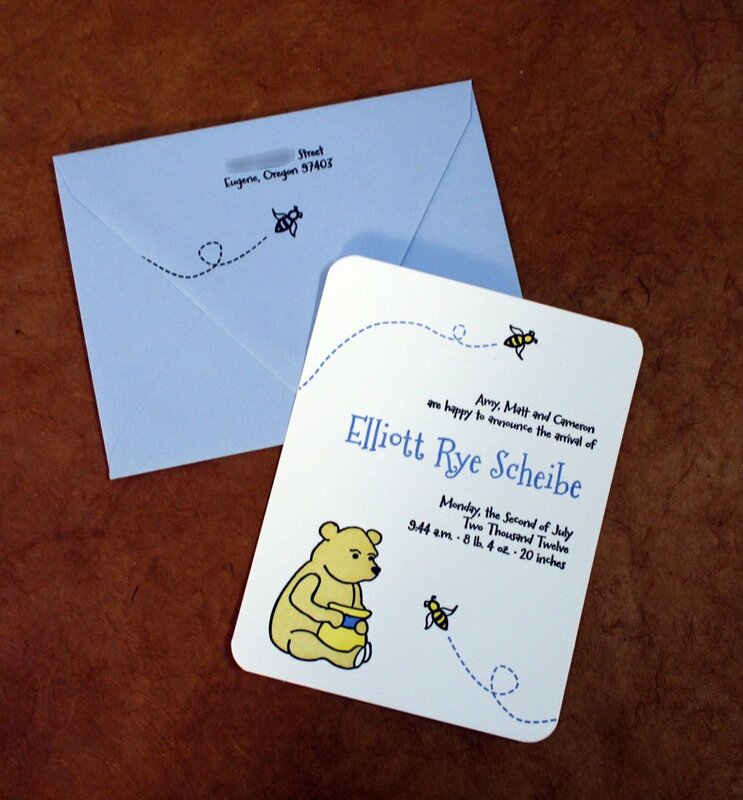 In order to make the envelopes match perfectly with the baby announcements themselves, I used the same fonts for Edwina and John’s return address as we did for Elizabeth’s cards, and we printed two of the cute little butterflies on the flap as well! Aren’t these just too cute!?! If you were curious what three photos Edwina and John chose for the announcements, you can see all three together in the grouping of photos below. Isn’t she beautiful?!? And, because I know you all can’t get enough of the awesome pictures, and there were so many wonderful ones of these announcements, check out the extra, gorgeous, detail photos below. Creating these baby announcements for Edwina, John and Elizabeth was so much fun! I really can’t express enough what a wonderful family these three were to work with, and how much I just love designing birth announcements! If you or someone you know is expecting, and are interested in custom letterpress baby announcements or shower invitations, please don’t hesitate to contact us. We would love to work with you! Thanks so much Edwina, John and Elizabeth! You’re the best! 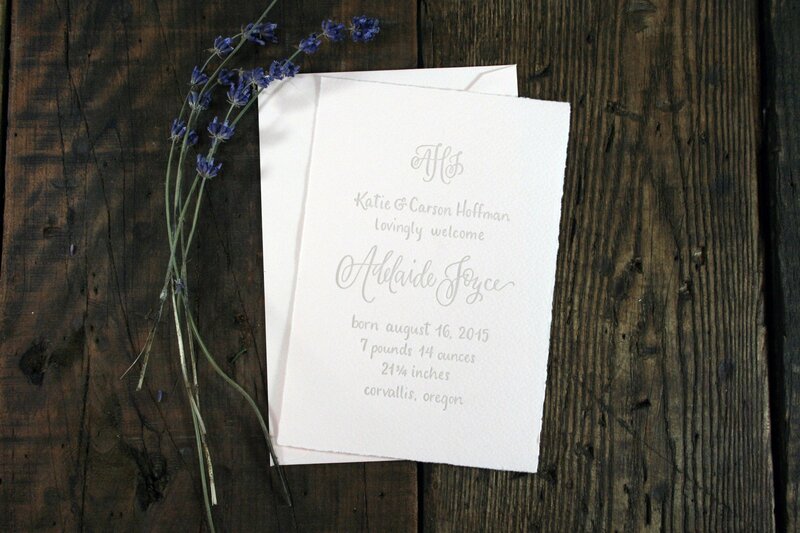 Admittedly, Twin Ravens Press prints a lot more wedding invitations than birth announcements, and we totally love doing them, but there’s just something about creating sweet little cards for families with newborn babies that makes me smile. 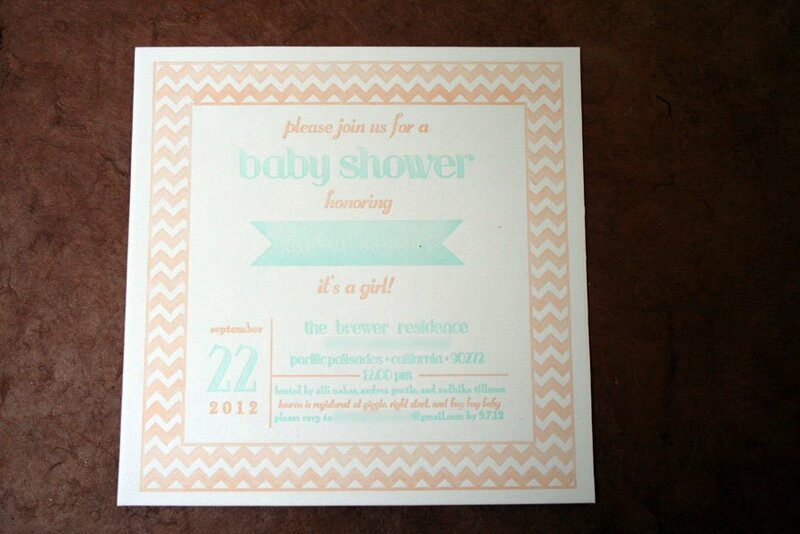 Earlier this month we printed this sweet little birth announcement for the boss of a really good friend, Emma. I met Emma earlier this year when she wanted to visit Twin Ravens Press, and since then she’s been coming by and helping us out on a regular basis with whatever needs to be done, which is really really cool. Emma studied design and printmaking while she was in school at the University of Pennsylvania and had been looking for a way to get back into it in Oregon. I’ve really loved having her around, not only as a helper, but as an awesome friend. So, when Emma proposed that we worked together on the announcements for her Pennsylvania boss’ first baby, how could I say no? Emma designed the super-cute, A7 letterpress announcement that you see above and she and I printed them together! Nodumo’s announcements were printed in two ink colors: a light, bright, purple and a bright, earthy green on Crane Lettra Pearl White Paper. I love the design Emma created for the text of this announcement and I just love the fonts that she used! Plus, her flowers and butterflies are totally cute! We paired this announcement with a lighter, coordinating green envelope from Waste Not Paper Company and printed the family’s return address on the envelope flap in green ink. Aren’t those totally adorable?!? If you or someone you know is expecting a baby in the near future, please contact us if you are interested in creating some custom baby announcements and/or shower invitations of your own! We would love to work with you! Check out these absolutely adorable baby announcements we printed a few weeks ago for a good friend, Heidi, and her fiancee Derek’s, brand-new baby girl, Veronica! Heidi and I played soccer together several years ago, when I was in college, so I was super excited to design and print the announcements for her first child! Veronica’s announcements are an A2 size (measuring 4.25″x5.5″) and were printed on Crane Lettra Pearl White paper in two ink colors: chocolate brown and a light, bright purple. When we talked about what sort of design she wanted for her baby announcements, Heidi told me that she had been receiving tons and tons of baby gifts with owls on them, so owls just seemed like the right motif. At the time that we started designing, Heidi wasn’t sure if she was having a boy or a girl, so we also figured that depending on the colors we used, an owl design could work wonderfully for either gender. As you can see, though, Veronica ended up being a girl, so we used purple as the accent color for the owl, tree leaves and her name on the announcement. Another thing I just love about baby announcements is the fun, whimsical fonts you can use for them! For Veronica’s announcements we used a mix of Tart Workshop’s “Silverstein” for the main font and “Leroy Brown” for the name. Totally cute, don’t you think?!? Heidi and Derek are getting married this upcoming spring and we’re also designing and letterpress printing their Save-the-Date cards and wedding invitations! Check back in down the road if you want to get a peek at those! Thanks so much Heidi & Derek! You guys are awesome! Cameron’s announcement is an A2 size card with rounded corners, that features two little buzzing bees and their pink dotted flight paths. The announcement was printed in three ink colors: black, yellow and a bright, cheery, strawberry pink. The announcement was paired with a matching strawberry pink envelope from Waste Not Paper Company and the family’s return address and another little bee were letterpress printed on the back flap. 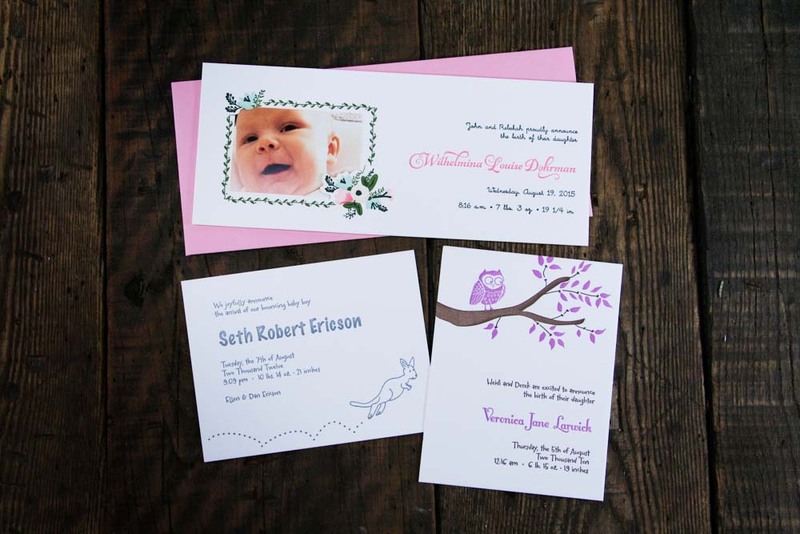 Twin Ravens Press doesn’t print nearly as many birth announcements as we do wedding invitation suites and related materials, but I absolutely love doing them when we get the chance! A letterpress printed birth announcement is such a classy, sweet and charming way to announce/introduce the newest member of your family! Check out some more close-ups of Cameron’s below! Aren’t they just too cute!?! If you or someone you know has, or is going to have a new addition soon, and you’re interested in birth announcements or shower invitations, please contact us! We’d love to work with you! Thanks so much again Amy, Matt and Cameron! You guys are awesome!